Yesterday, it came out – the first release candidate of the next Blender-Version [Download], the last one before the big change of version 2.50. I dare saying that because there is not so much space in the number for another one – although 2.49a is still possible. Of course the first and most important question is: What’s new? Well – in my opinion, it’s quite a lot of things! 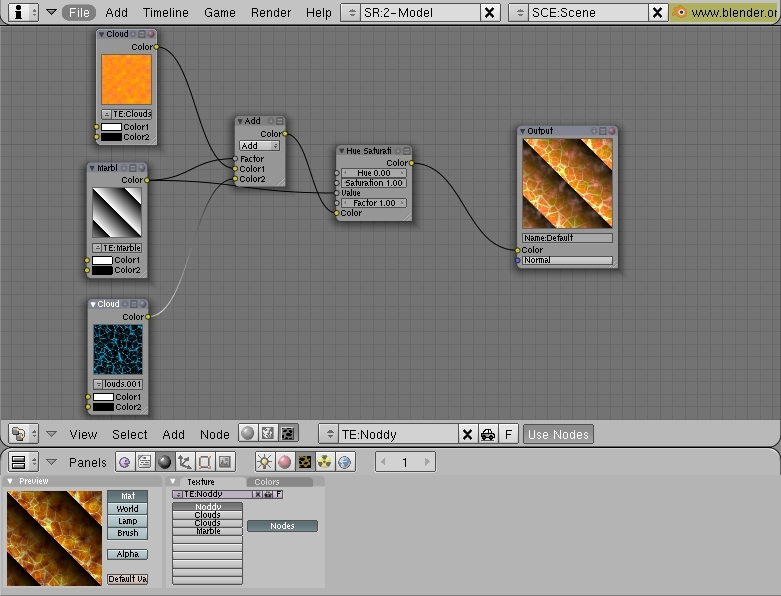 Texture Nodes – what was already possible for materials and renderings before now found its way into the texture editor. They seem very helpful to me, making things like stencil-textures much more intuitive and usable and of course offering totally new possibilities. Game Engine improvements – Video textures, a logic API cleanup and new GE actuators promise a more powerful Blender Game Engine and Dome rendering also offers interesting new possibilities. Etch-a-ton – Creating armatures by drawing them onto your mesh. If you want to know more about it, watch the videos about etch-a-ton on vimeo or take a look at the developer’s documentation. Projection painting – the possibility to draw texture images or procedural textures directly on your unwrapped mesh can make texturing much more comfortable. And of course – bugfixes! So let’s look forward to the next release candidates and the final version. And please play around with the new functions and report bugs – that’s the only way to avoid an additional bugfix-version this time. Previous Post Blender F1 Challenge 2009 starts today!